Hozi Homes has always formed part of our free portal partners that we feed property data to for advertising on behalf of our real estate clients. During the month of March 2017, they confirmed that this portal will no longer offer free advertising. All current clients already advertising stock on Hozi Homes will still enjoy the benefit of free advertising for the time being but, unfortunately, new sign on's will be approached by their sales team and offered either a 6 or 12-month contract deal to advertise on this portal. This will apply to clients either listing through the OMS or making use of the Sync Syndication service. 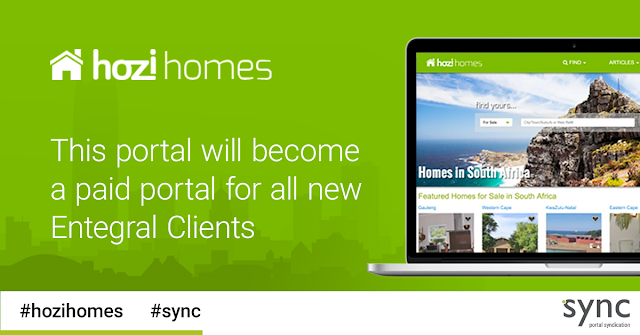 Clients already advertising on Hozi Homes will also be approached in due time and given the option to continue advertising on this portal at a fee or to cancel their current feed from Entegral Technologies' Sync service. Thus please be aware, that all clients who signed on during the month of February or March will no longer have the option to select Hozi Homes as a free advertising platform unless you have a paid subscription with them.